The SIS electrodes are made from a specialized nylon ripstop material that is electro-plated (coated) with pure silver. Two SIS electrodes are positioned on the skin, on either side, or on the front and back, of the body or head, so that the target infection is aligned between them. The SIS electrodes are held onto the body with standard medical tape. The SIS machine delivers a high precision, extremely small Output Current to the SIS electrodes (billionths of an ampere of electric current). Utilizing state of the art sensing technology, the SIS machine automatically regulates the target Output Current with environmental changes, including hydration, perspiration, millisecond-speed body movement, and with both body and ambient temperature changes. 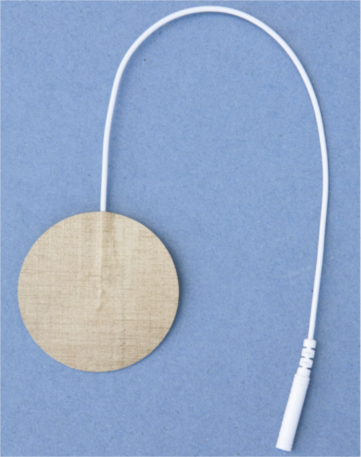 Electrode stimulation efficiency (ESE) smart technology—self-adaptive algorithms monitor, log and analyze electrode↔skin contact in real-time and statistically per session; and auto-adjust stimulation parameters and Output Current to ensure continuity and therapeutically sufficient stimulation during each treatment session. The user is provided by the device software with real-time audio and visual alerts to maintain correct electrode contact with the body. The Output Current from the SIS machine causes a chemical oxidation process on the surface of the electrically (+)positive SIS electrode. This process results in the release of atoms of silver having a positive electric charge (Ag+ cations) from the electrode. 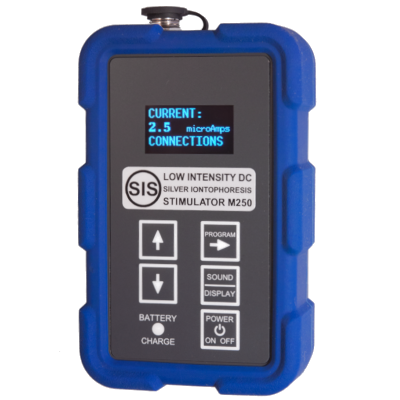 The SIS machine M250 model generates a constant, low intensity direct current (LIDC) between the SIS +ve and -ve electodes. 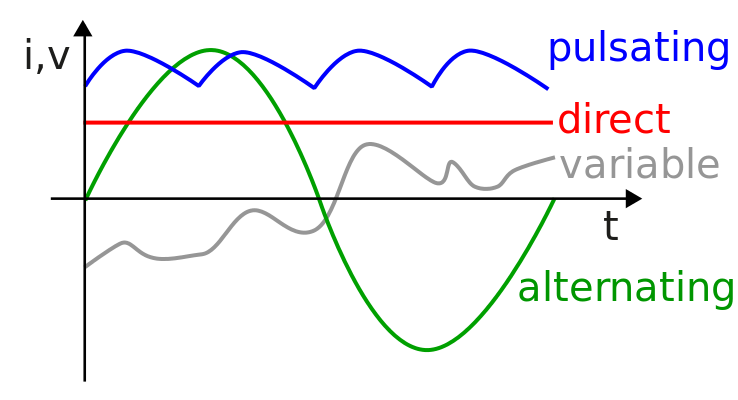 Direct current (i) illustrated by the straight red line that represents the constant intensity of charge carriers with time (t). 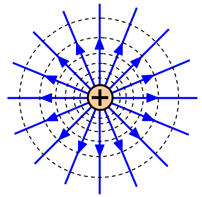 Each silver cation is a point source of a nonuniform electric field—resulting from its +ve electric charge. A nonuniform electric field has strong effects on biological cells. Nonuniform electric field effects on biological cells are described as dielectrophoresis, which is a term that combines the concept from physics, dielectric—meaning that the internal electric charges of an object are polarized by an electric force, with the concept of phoresis—meaning, transporting. The constant direct current of silver cations (point charges) passing through the infected cell and tissue microenvironments, which the SIS equipment produces, additionally has this potential dielectrophoretic action. Integration of Silver Iontophoresis Principles in a Device for Bacterial and Viral Infection Treatments, Wound Healing, Tissue Repair and Regeneration. 31th Annual International Symposium on Acupuncture, Electro-Therapeutics and Latest Advancements in Integrated Medicine. May 01-03, 2015, São Paulo, Brazil.